Circa 1845. Beautifully restored to all its former glory, this historic Cape Cod home is furnished with antiques and elegant window treatments reflecting a romance and a peacefulness of an earlier time. Each of the luxury guest rooms and suites is individually decorated and accented with luxurious linens and fine bath amenities. All have large private baths, some with Jacuzzis for two and/or fireplaces. Enjoy a carefully prepared seasonal breakfast served each morning at a table for two. As evening draws near, relax with a complimentary cordial in the formal parlor or out in the garden. Payment Types Accepted Include Visa, Discover, American Express, Master Card, GIFT CARDS FOR ILOVEINNS, BEDANDBREAKFAST.COM and BNBFINDER. This property has 9 total guest accommodations with private bath, 9 with hot tubs, 3 suites, 8 cottages and 4 guest houses. The types of beds available include Queen and King. Private rooms done in a tasteful Romantic decor, Romance Packages, Breakfast served at tables for two, fresh flowers thought inn and in guest rooms, Jacuzzis for two, and fireplaces in most rooms. 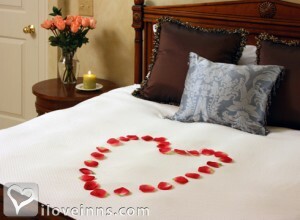 Amenities include champagne, roses and rose petals on your bed! Beautiful flower gardens. 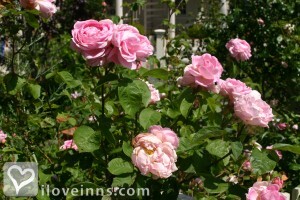 Professionally landscaped gardens full of Roses, Hydrangeas, Peonies, Lilly's, Tulips and Daffodils. Many Adirondack chairs and tables to sit and enjoy the 1+ acres. 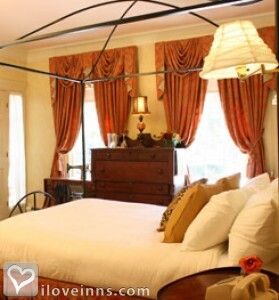 This delightful room has a charming Queen-size iron canopy bed. The private bathroom has a large glass brick walk-in shower. Hair dryer, stunning window treatments, private entrance out to wraparound veranda, cable TV and VCR, in-room phone, large closet, iron and ironing board, A/C. This very romantic room welcomes you with an antique Queen-size canopy bed, private entrance and an oversize two-person Jacuzzi tub and shower. Cable TV with VCR, private direct dial phone with data-port. 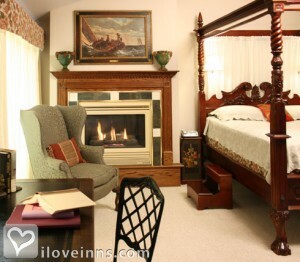 This beautiful bright and sunny getaway room features a King-size antique bed. Large bathroom with a two-person Jacuzzi tub and shower, private entrance, cable TV with VCR (100 title in-house video library), individual temperature controls. This elegant accommodation features an authentic antique &34;French Empire&34; King-size bed. A large bathroom with a two-person Jacuzzi tub and shower, writing desk, settee, cable TV with built-in VCR (100 title in-house video library), individual temperature controls, private direct dial phone with data-port. Each suite features a beautifully decorated livingroom, separate bedroom with an antique Queen-size bed, a large sunken bathroom with Jacuzzi tub & shower. Each suite also has its own individual heat and air conditioning control, cable TV with built-in VCR, private direct dial in-room phone with data port, an iron and ironing board and hair dryer. 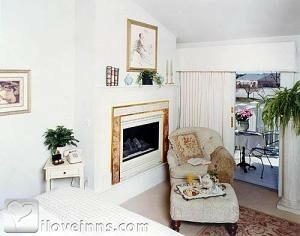 The Captain Farris Suite (6) has a working gas fireplace. 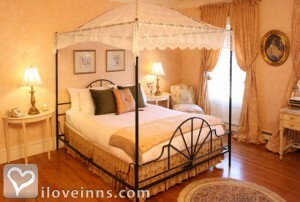 A beautiful and very romantic accommodation with an antique Queen-size four-poster canopy bed. Gas fireplace, a walk-out sundeck, an extra large bathroom with a Jacuzzi tub and shower, cable TV with VCR, in-room phone, hair dryer, plenty of closet space, iron and ironing board and private entrance. A wonderful accommodation to spend a weekend or more. Decorated in a stunning mix of contemporary and antique styling. It features a King-size bed with a hand-carved headboard, has a gas fireplace, a walk-out sundeck, an extra large private bathroom with a Jacuzzi and shower, cable TV with VCR, in-room phone, hair dryer, iron & ironing board. Should you need to cancel all or part of a reservation, the inn must receive notice no less than fourteen (14) days prior to your scheduled arrival date. At that time your deposit will be refunded less a cancellation fee of $30. For cancellations of all or partial reservations received less than fourteen (14) days prior to your current arrival date, no refund will be issued and you will be charged for the entire reservation unless the inn is able to re-rent the room.Reservations paid for with gift certificates are subject to the same cancellation policy. Early departures/late arrivals are considered cancellations and are subject to the same cancellation policies. In the event of severe weather to the point that travel is unsafe. You will be charged for your entire reservation and a credit will be issued to be use within one year from date of cancellation. Quaker Village of South Yarmouth (within 1 mile radius), Judah Baker Windmill (1 mile), Old King's Highway (4 miles). VOTED GOLD FOR BEST OF CAPE COD! The dates this property will honor the certificate are November-April 15th, subject to availability. Excludes Thanksgiving Week, New Year�s Eve/Day, Valentines Weekends, President Day Weekend. Wonderful Hospitality, romantic and cozy. Thanks for a wonderful honeymoon! We had a great time and will be back to visit! We love your elegant bed and breakfast. Thanks for the warm hospitality. Beautiful, quiet and so romantic...wow! Can't wait to come back! Thank you for the red rose and champagne waiting for us. We had such a wonderful anniversary weekend. A real jewel in the crown! Perfect! Nancy-you need to publish a recipe book "Nancy's Fantastic Breakfasts" especially the muffins! We had a fabulous time as usual. Thank you Nancy and staff for another wonderful stay. Thanks so much for all your help in making our stay so much fun. A grand house in such a lovely place. We could not have picked a better place to spend our 25th wedding anniversary...Love your B&B...Love your state! Thanks for everything. We had such a wonderful time! Fabulous place and breakfasts. Thank you so much! Everything was beautiful here. The food was fabulous. Nancy and her staff were very helpful and kind. Will be back! Thanks so much! Lovely place, very comfortable, intimate and relaxing. In 2 words 'extremely enjoyable"
Our second stay here and it was just as wonderful as the first time. Can't wait to come back! Absolutly love it here! We honeymooned here 4 years ago and we try to come back each year! This is our 3rd time here...so relaxing and comfy. We love it! This was a beautiful start to our honeymoon! Thank You! Wish we could have stayed longer. Such a place to relax in after such a busy sight seeing time. Thank you for your outstanding Hospitality! We loved our stay and hope to re-visit soon. Surpassed all expectations...had a wonderful stay! We had an amazing time, very peaceful, ralaxing and romantic. See you soon I hope! Lovely room and wonderful breafasts. Thanks so much for helping to make our 25th memorable! We so much enjoyed our 3rd annual visit! Can't wait until next year. Thanks for everything. Thank you for the most wonderful stay. This place is perfect! It is our second time here. Such a beautiful place with a restful atmosphere. Can't wait to come back! Your inn is beautiful. Everything far exceeded expectations! Thank you. Lovely, comfortable with elegance. Will be sure to return. Completely exceeded our expectations! We'll be back and send friends! We had a wonderful romantic getaway. Can't wait to come back! We travel all over the world and this is, by far, one of most favorites places and for sure our favorite B&B! Everything was better than perfect. You are with friends when you stay here! Wonderful time had by all. Nancy and staff were great. Beautiful home and delicious breakfasts. 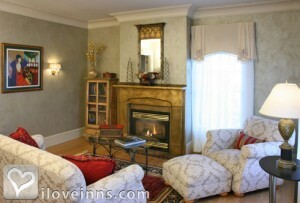 Cape Cod is so beautiful and the Captain Farris House is a romantic retreat. We will be back soon! Your place is outstanding! We had a great time. This is the right place. Best long walks and lovely breakfast made by Nancy with the lovely smile! Such a beautiful weekend get-a-way. Best B&B experience of all time! Thank you. Thank you Nancy for your hospitality. We enjoyed a peaceful and romantic time here. We will be back! Thank you so much for making our stay here special. Our room was so romantic and your hosptiality outstanding. We loved everything your B&B had to offer and we can't wait to come back! The beauty is in the details of this Inn. Thank you so much for this litte piece of heaven. Thank you for making our honeymoon truly memorable. Great staff, wonderful and fantastic recommendations. Our room was so romantic it made us forget all about the rain! We are looking forward to coming back to relax time and time again. Thanks for the beautiful and comfortable place to stay during our wedding! Lovely B&B and fantastic breakfasts! What a wonderful treat. Beautiful home-delicious breakfasts and friendly people...loved it! Food was amazing and everything about it was romantic and relaxing! We made a perfect choice! Great hospitality, great food and a cozy room. What a beautiful place. So comfortable and welcoming. We can't wait to come back! Everything was perfect. Thanks for the memorable stay in Cape Cod. What a beautiful B&B. We really enjoyed the warm and friendly atmosphere. We had a wonderful stay. It felt like our home away from home. Thanks for everything. Nancy & Staff, Thank you deeply for the beautiful stay at your amazing B&B. Our restful room and atmosphere were just what we needed. We enjoyed everthing about our stay and hope to take the peace you created here back to our home. Thanks so much for a wonderful stay! We loved each breakfast meal that was served! Our room was cozy and so romantic! The was exactly the extended weekend away that we needed. We are celebrating our 10year anniversary here and you made it extra special. What a beautiful inn you have. The staff and yourself, Nancy, are absolutly wonderful! Our room was very cozy and we just loved the jacuzzi for two. We didn't want to leave. We will be back for a second time. Thank you for supporting our military with your great military discounts. The Captain Farris House exceeded all of our expectations, from the romantic accommodations to the lovely gardens and grounds and the delicious breakfasts. It was a memorable stay. Thank you for your generous hospitality and recommendations. The only place I stay when I visit Cape Cod. Immaculately clean, wonderful breakfasts, friendly and helpful staff, beautifully decorated, centrally located. We had the most womderful romantic getaway. Cant wait to come back! Thank you for a lovely time. The B&B is like a home away from home. We were made to feel really welcomed and pampered by a great staff! We had a great anniversary weekend, thank you! We loved our romantic room and yummy breakfasts. 3rd visit and it is still a wonderful experience. Beautiful clean rooms, great breakfasts and warm hospitality. The only place I stay on Cape Cod! An incredible place to stay! the breakfast was delicious. The rooms are decorated so beautiful and are so clean. We would highly recommend! 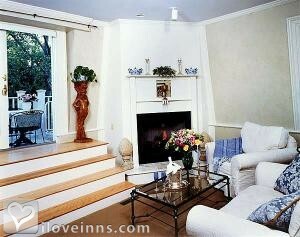 If you're looking for a weekend of romance, look no further than The Captain Farris House B&B. Thank you Nancy and Michael, you were beyond hospitable and welcoming. Wonderful time at our favorite B&B. Cant wait to return. Thank you Nancty & Michael. Beautiful Inn, our 3rd time here! Love the little details that make this place so cozy, relaxing and romantic! We had a delightful time. 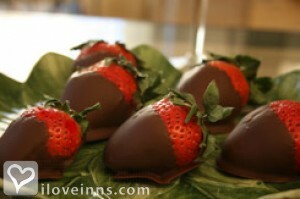 Everything was perfect and the staff friendly and helpful and food great! A very peaceful and beautiful restful retreat with wonderful hospitality. Will recommend. Staff is welcoming and eager to help. Comfortable beds, delicious breakfasts and great location! As always, a wonderful, relaxing stay! Thanks for your warmth and hospitality. My husband and I had such an amazing retreat at the Captain Farris house last weekend. It was everything and more than we expected. Our room, Bray's retreat was elegantly decorated. The two person jacuzzi was a great treat. Nancy and Micheal were fantastic hosts. They gave us an excellent idea to have dinner at this great Irish Pub. There was live music and so authentic! We will definitly be back! 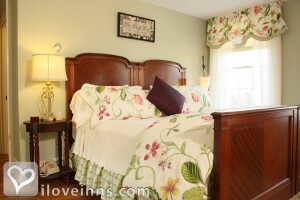 We had a great weekend at this beautiful romantic Bed & Breakfast. The breakfast was amazing-3 courses and the best coffee I have ever had! Our room was immaculate with a large private bath with a double jacuzzi. The owners, Michael & Nancy and their staff could not do enough for us. We are looking forward to returning this summer when the gardens are in bloom. We highly recommend this inn. My boyfriend surprised me with a trip to Cape Cod for my 21st birthday. We had a great time. Nancy was a great host and cook and even left me a birthday card on our bed. I would definitely stay here again. This is such a beautiful romantic property inside and out. We got engaged here and we will never forget our cozy romantic suite. The owners are so friendly and helpful. Breakfast was awesome. Just a perfect experience. 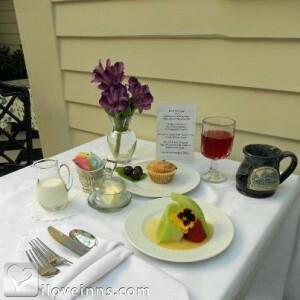 My husband and I stayed at the Captain Farris Bed & Breakfast in October. We stayed in the Captain Farris Suite on top floor. The suite was quiet and romantic with high ceilings and beautiful drapes, a fireplace, large living room and separate romantic bedroom and a really large bathroom. We were celebrating our anniversary so Nancy had a red rose with chocolate covered strawberries in our room when we arrived, complimentary! The entire weekend was magical. The entire house is beautiful and also very clean which is important to us. We can�t wait to return next year. 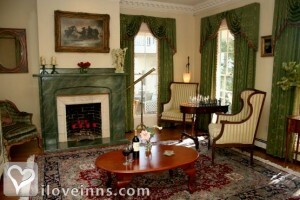 We visit this inn each year and our visit is always the perfect romantic and elegant getaway. Nancy makes us feel like we are her only guests even when they are booked up. The beautifully decorated rooms, gardens and all the little extras make for a wonderful experience. 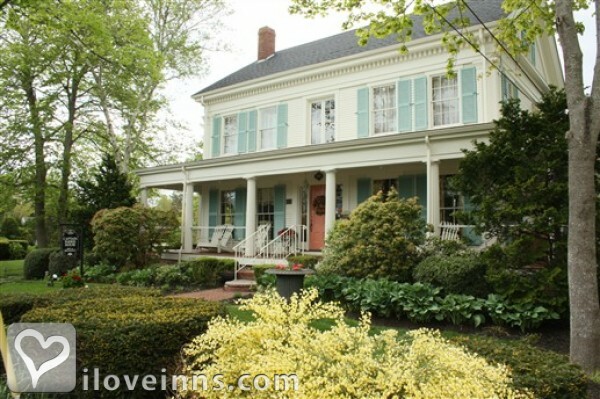 If you're looking for a weekend of romance, look no further than The Captain Farris House B&B. My fiance and I stayed at the inn this past August for the first time and we were floored! We've stayed at many inns all over New England, and this one surpasses them all. The inn itself is absolutely stunning - on the inside and the out. The rooms are very spacious and beautifully decorated. All the rooms have private bathrooms, which is a huge plus. We stayed in Room #2 (Captain's Quarters) and let me tell you - it was romance at its best! From the canopy bed, to the jacuzzi bathtub, there wasn't a moment that we didn't feel relaxed and in love! Nancy and Michael, the innkeepers, were beyond hospitable and welcoming. We could immediately tell that they LOVE what they do! 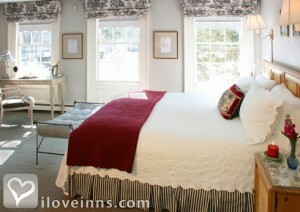 They are passionate about their inn - and know EVERYTHING there is to know about things to do in Cape Cod! The food was incredible - from the afternoon teas and cookies - to the decadent breakfasts prepared each morning (all homemade by Nancy!). We cannot say enough about this B&B. We already booked our reservations for this summer (we're staying for a whole week this year...one weekend simply wasn't enough!). My wife and I stayed at the Captain Farris House last fall, and we fell in love all over again! The inn was romantic, beautiful, and timeless. The service was fantastic (thanks Nancy & Michael! 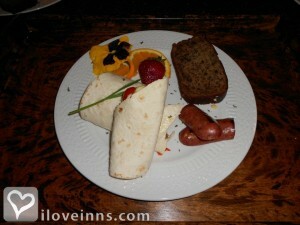 ), and the breakfast - terrific! If you're looking for a romantic getaway for you and the person you love - look no further than CFH. Trust me, you won't be disappointed! We stayed at the Captain Farris Inn for a long weekend at the end of October. It was perfect from the great breakfasts to the peaceful historic surroundings. Nancy and her staff offered great hospitality but giving us plenty of privacy. This was our second stay here and we are looking forward to returning for a third. We stayed in Russell's Hideaway and loved it! Beautiful historic home with warm hospitality! We had the perfect weekend here. Quiet, convenient location. We mentioned it was our anniversary and when we came back from dinner we had chocolate covered strawberries and a red rose waiting for us. So nice! Beautiful clean welcoming home. Breakfasts is amazing and served to couples at a little table. Afternoon cookies and cocktails in the evening. We had a wonderful time. We were in the process of booking our stay at the Captain Farris House for next season and thought we would write about our experience of last season's stay. We have stayed at many bed and breakfasts and this is by far our favorite. It is such a nice atmosphere. Nancy, the innkeeper is very gracious and seems to always be there when you need her but at the same time gives us our privacy. Her breakfast is delicious and something we looked forward to each morning. The rooms are very clean and so pretty without all the fluffiness you find at some places. We are looking forward to our next visit! 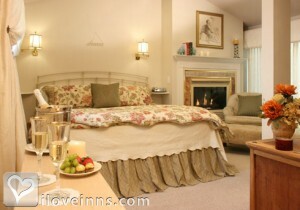 We stayed at the captain farris inn for just one night while attending a wedding in the area. Everything was so perfect from every detail tended to, to the location, the delicious breakfast and friendly innkeeper, nancy. We would not hesitate to recommend to all our friends and family. We are staying at the Captain Farris House. All previous reviews are true. Great breafasts, everything so clean and inviting, wonderful hospitality and in a great location to get around. My husband and I had a beautiful weekend here and can�t wait to stay here again. We stayed in the Phoebe White Suite which was private and had every amenity one could need. 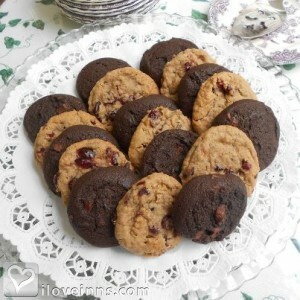 Nancy is a wonderful hostess and her breakfasts are a delicious treat each morning! 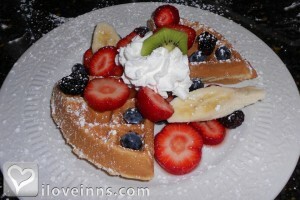 Captain Farris House breakfast each morning is superb! Nancy and her entire staff is warm, helpful and friendly. Our room, bed linens and bathroom amenities were wonderful. The entire house is so clean and fresh. Fresh Flowers everywhere and a perfect red rose in our room. We will definitely be back. Can't say enough about Nancy and Gail - they make you feel like family. You must experience it for yourself! I surprised my wife with a weekend at Captain Farris. It was a great choice. Very romantic place with nice rooms and great breakfasts. We liked that we had our own table for breakfast. There is allot to do in the area. We are ready to go back come fall. Would highly recommend for anyone wanting a romantic getaway.